After much consideration and deliberation, we have finally announced our Top 25 gymnasts for the 2017 International Gymnast Magazine Gymnast of the Year Award. In consideration for this prestigious award, all of our top 45 nominees were closely looked at and everything was a factor from your votes to videos and from the feedback we heard from the coaches and gymnasts themselves while also seeing the athletes’ incredible performances throughout the 2017 season. We will be announcing the top 10 gymnasts and our Gymnast of the Year at the event in Oklahoma City and we congratulate all gymnasts nominated on their hard work and incredible accomplishments. See you all in OKC! The sister of London 2012 alternate Sarah Finnegan and committed to LSU just like her elder sibling, Aleah Finnegan out of GAGE in Missouri is a beautiful gymnast, with her elegant lines on balance beam her signature. Finnegan posted her season-high all-around score at her final meet of the 2017 season, winning first all-around at JO Nationals with an impressive 38.300 overall and a second place finish on the vault and balance beam as well. Finnegan is 14 years old and from St. Louis, Missouri. 2017 was Chloe's 3rd season as a level 10 gymnast. 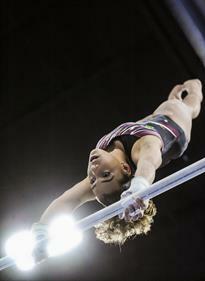 She trains at Texas Dreams Gymnastics under coaches Kim Zmeskal-Burdette and Chris Burdette. In 2017, Chloe was the Texas State AA champion, Region 3 AA champion, JO National floor champion, and was named to the JO National team for the 2nd year in a row. Chloe was also honored with the 2017 Texas USAG Optional Athlete of the Year award at the state banquet in July. Chloe is a junior in high school and is verbally committed to the University of Arizona. She lives in Frisco, Texas with her parents, brother and sister. In her free time, she volunteers at her church and for Frisco Love Pacs, an organization providing food for Frisco ISD students who need meal assistance when school is not in session. She also enjoys hand lettering and calligraphy, reading, and spending time with her family and friends. Hello, my name is Courtney McCann, nickname Court Short. I recently turned 12 years old, and I am training level 9 at WOGA Gymnastics under the direction of Yevgeny Marchenko, Sonia Haiou and Adam Duncan in Frisco, TX. I spend 7-8 hours/day training not only level 9 skills but also Olympic style skills. My favorite thing about gymnastics is learning new skills, and being with my teammates and coaches every day. Teamwork at WOGA is the key for all of us to reach our goals. I will be in the 7th grade 2017-2018, and taking advanced High School classes in Math through my school in my gym. I am a Junior National Honor Society Member. In my spare time I volunteer around the community to fulfill my JNHS hours. Cristal started at Gymcats when she was 6, and has worked with Cassie Rice and Jill Preston through her whole career. She has had a great gymnastics career in every event, and in 2017, won the AA at all her regular meets. She also was the highest Level 10 score at the Lady Luck meet in Las Vegas and qualified to the Nastia Cup. At the 2017 Nevada State meet, she won all events and the AA with a 38.375, and continued to do a great job at the Region 1 Championships with 2nd place AA, and is the regional bar champion. At the 2017 JO Nationals, she won the bars title, 2nd on beam and placed 3rd AA, and made the JO National Team! She's looking forward to her last Level 10 season this year and her goal is to graduate with an Advanced Honors Diploma from Green Valley High in Henderson, NV. She is committed to the University of Utah on a full ride scholarship, and will be starting there during the 2018-19 year. Thank you to MSO for considering her for Gymnast of the Year and placing her in the Top 45!! Hi! My name is Farah Lipetz and I'm a level 10/Elite gymnast training at Infiniti Elite in NY. I started gymnastics at 5 years old because my mom said I couldn't sit still......I loved it from that second on. I've had a really awesome career up until this point, but my proudest moments were this year when I won 1st AA in the Maccabi Worlds qualifier, 1st AA in my Hopes Elite qualifier, 1st AA at Regionals, NY State beam champion and 2nd AA, 8th place AA at the JO Women's Nationals and 3rd AA nationally on beam, finally getting to end the season by competing at the HOPES Elite Championship at the Karoli Ranch in Texas. I've been pretty busy, but am continuing to upgrade my skills and train really hard this year for Junior National Elite and Nationals. My goals this year are qualifying for P&G's and hopefully securing a college scholarship because my dream is to compete in college. Thanks for reading!!! I am currently training level 9 at Orlando Metro Gymnastics in Central Florida. I am a straight A student in all honors classes and also a member of the National Junior Honor Society. As a level 8 gymnast in 2017, my scores were listed in Americas Top 100 for vault(5x), uneven bars(2x), floor exercise(1x), and all-around(3x). I qualified to the Region 8 Championships and won the all-around title with a 38.600, while also earning gold medals on vault, uneven bars and balance beam and a bronze medal on floor exercise. I love the uneven bars and I’m working on my Pak Salto and upgrades such as blind changes, front giants, and double layouts for my dismount. I train 22.5 hours per week under coaches Jason Rawling and Carrie Loeser. I enjoy playing the piano, swimming, art, and being active in the community. Fun fact - I love creating seasonal and beach paintings. My goal is to become an elite gymnast as well as obtain a Division I college gymnastics scholarship. It is an honor to be in the Gymnast of the Year Top 45 Nominee pool. It would be a privilege to be recognized with the prestigious award of International Gymnast Magazine's - Gymnast of the Year. This would reflect my dedication to academics, community service, and my favorite sport gymnastics. 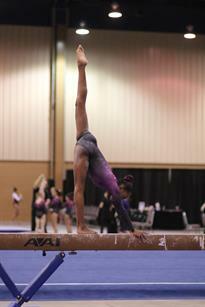 Hunter Dula is a level 10 gymnast competing for All American Gymnastics. She moved to Utah from North Carolina in October 2016. Two weeks after arriving, she broke her foot and was in a boot until the first week of January 2017. Hunter competed bars her first few meets of the season and then went on to place first All Around at the Utah State Championships (38.275) and 6th at Region 1 Regionals (38.0). She finished the season with a 10th place finish AA at Nationals (37.775) and 11th on bars and beam. Hunter will be joining the University of Utah Gymnastics team in 2018 on a full ride athletic scholarship. Hunter's father is military, and she has previously competed for Southeastern Gymnastics (NC), Rock Solid Athletics (TX), and Naperville Gymnastics (IL). Hunter has had several injuries including a broken elbow that she sustained just prior to the Nastia Liukin Cup in 2016. The injury wasn't identified until almost a month later and required surgery to properly heal. Hunter is a fighter and adversity has taught her that a warrior never gives up! You will always find Hunter at the gym working hard even when she is injured. She is a straight A student and loves math and science, and eventually she'd like to become a physical therapist and help athletes struggling with injuries. In her spare time, Hunter likes to do crafts, ride horses, and hangout with her family. Hunter loves being at All American and appreciates all of her coaches and teammates that have supported her throughout her gymnastics career. Madison Raesly-Patton was born on July 17, 2004 to Amanda and Shea Patton. 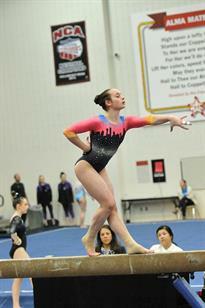 Madison began gymnastics at the age of 9 when she took an introductory class at WOGA Frisco. On the second day of practice, Madison was moved up to the intermediate level, and by the third day she was moved up to the advanced level. 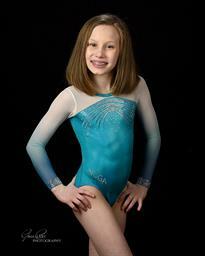 By January 2014 at age 9, Madison competed one meet of level 3 in the TAAF program with Iarov Elite Gymnastics. After one meet of level 3, Madison moved up to level 4. In the Fall 2014 season, Madison competed level 5 and in the Spring of 2015, she competed one level 6 meet. In 2016, Madison competed one meet of level 7 at the Texas Prime Meet where she placed second on vault and third on floor. After the Texas Prime Meet, Madison moved up to level 8 and at her first level 8 meet, the Metroplex Challenge, Madison won the beam title with a 9.625 and placed third all around. At the 2016 Texas Level 8 State Championships, Madison finished 10th all around and qualified to regionals. Madison had her best meet of the season at the Region 3 Championships scoring a 9.700 on beam to take the beam title and taking home the bronze medal in the all around with a 38.050. Following the 2016 level 8 season, Madison began training with Texas Dreams. Madison began instantly improving, and at her first meet as a level 9, Madison won the beam title with a 9.725 and won the all around with a 37.775. Madison continued to have a solid season and at the Texas State Championships, Madison won the bars, beam, floor, and all around titles. Following her success, Madison competed at the Region 3 Championships and made the Region 3 Junior 3 Western National Championships Team. Madison had the meet of her life at Westerns; she won all four events and took home the all around gold with a 38.600. 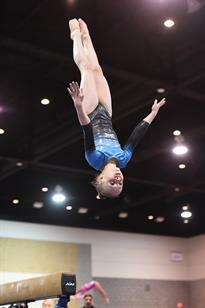 Madison became the first gymnast in history to win all five gold medals at Westerns and had the highest all around score out of all gymnasts at both Easterns and Westerns. Currently, Madison trains 32 hours per week at Texas Dreams Gymnastics under coaches Alicia Goodwin, Marcus Harlin, Kim Zmeskal-Burdette, and Chris Burdette. Madison is preparing for the 2018 season where she hopes to qualify elite. In the future, Madison hopes to earn a spot on the US National Team. Hi my name is Margie and I started gymnastics when I was 8 years old. Strength doesn't come from what you can do. It comes from overcoming the things you once thought you couldn't. This year has been the hardest year mentally and physically. I love to challenge myself and brave my fears. Not sure that I have a favorite event, and vault has never been my friend; however I am working hard to see some improvement on beam and bars. After ripping two tendons in my wrist just before Regionals, I am proud of earing 2nd All Around at Regionals. This journey is only possible because of great coaches and a gym that believes in me. 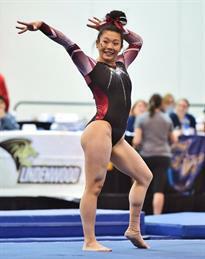 At the age of 4.5 year's old, Myli Lew was put into the Hot Shot's group and was doing 3 hours of gymnastics a week. She was slowly learning TOPs skills. At the age of 6, Myli began competing level 3 where she made the NorCal South State Team 2nd place all around. Myli made TOP's Diamond Team in 2014 and was also on the NorCal South State Champion for Level 4 placing 1st all around. After competing level 4, Myli competed one level 5 meet off season. She was the only level 5 off season gymnast to compete from her gym and won 1st place all around. Myli also made TOPs National A Team in 2015 and attended her first Developmental Invite camp in Feb '16. Myli was the NorCal South State Champion for level 7 in 2016 and represented level 7 NorCal South State Team at Regionals where she was 1st place all around. Myli has attended Developmental Camp twice so far in the later part of 2016. Myli can't wait to learn more skills. She has met a lot of great gymnasts from other gyms on my journey and loves being able to connect with them on social media since they live far away. November Lenz is a Level 10 gymnast for Dynamo in Tulsa, OK. The past year, during the 2017 Season, November competed Level 9. During her 2017 campaign, she was the 2017 Oklahoma State Level 9 Jr 2 Champion, finished 1st AA at the 2017 Region III Championships in the Level 9 Jr 2 division, and concluded her season with 2nd AA at the 2017 Westerns Level 9 Jr 2 competition. The highest score she recorded during the season was a 38.650AA at the Metroplex Challenge in Texas, which was the highest Level 9 score at the event. Inclusive of the aforementioned events, during the 2017 season, November never finished a competition lower than second AA; 6 First Place AA Finishes and 3 Second Place AA Finishes. Previous to 2017, she was the 2016 Level 8 Jr A2 Region III AA Champion, 2015 Optional Oklahoma State Champion Level 6, and the 2015 Nadia Comaneci International Invitational Champion Level 6 9A and Nadia Comaneci Award recipient. Hi! 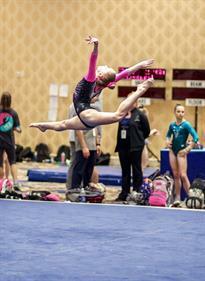 I am Olivia and I am a Level 9 gymnast at Edmond Gymnastics Academy (EGA) in Edmond, OK. In 2017, I was the Level 8, Region 3 floor champion and finished second on beam and third all-around as well as being the Oklahoma state all-around, beam and floor champion and third place finisher on bars. I was also a member of the Oklahoma Level 7 Judges Cup Team that won the National Judges Cup Team Invitational in 2017. I attend Saint Elizabeth Ann Seton Catholic School where I am a member of National Junior Honor Society. I have one brother, Isiah, who is my biggest cheerleader at my gymnastics meets. 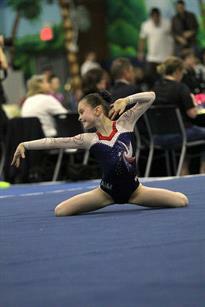 Rachael Lukacs is a level 10 gymnast from North Stars Gymnastics in New Jersey. I began my gymnastics career at the age of 4. I am being trained under the guidance of Julia and Barry Coss at Rochester Gymnastics Academy in Rochester, NY. I went on to qualify for TOPS 3 times, and made it to Developmental in 2015. Unfortunately, I broke my arm in 2015, had 3 surgeries and did not compete for the 2015-2016 season. I came back strong in the 2016-2017 season. Winning New York State Championships All Around with an overall score of 38.675, first place on vault, beam, and floor also winning Region 6 level 8 Regional Championships All Around with a score of 38.555, first place vault and floor. I am currently training level 9. Sophia began competing in gymnastics at the the age of 5. She is a Level 9 gymnast currently training for Level 10 this coming year(2017-2018). Her favorite event is Vault and she loves flipping where ever she can. Sophia trains at Phoenix Gymnastics in Old Bethpage, NY five days a week with her teammates. Besides Gymnastics, her passions are art, traveling, and being a social butterfly. She ended her year with great success. 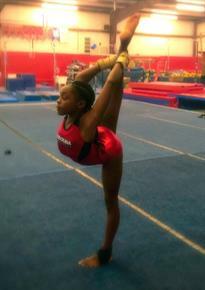 She came in 1st place AA at States, Regionals and Nationals (level 9). She continues working towards her goals and becoming the best she can be. 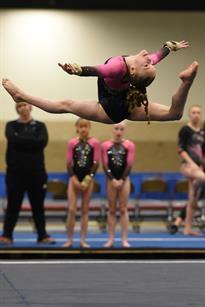 Zia is a 10-year-old level 9 gymnast training for HOPES Elite. At age 6 she competed as a level 3 gymnast in Louisiana winning the state competition. The following season, Zia competed as a level 7 gymnast winning the Louisiana state competition and 13 at her first regional meet. During the 2016-2017 season, she won the level 8 Fruge award as the all-around winner at the Louisiana state competition and 4th place at Regionals. Zia attended 3 developmental invite camps during her career. Zia transition to Columbia, SC June 2017 due to her mother's military duty and now trains at Carolina Gymnastics under Coach Anna Sexton. Although she loves and misses her Louisiana gymnastics family, she is excited to compete with her new gymnastic's family, to grow, and achieve new skills. Her ultimate goal is to compete at the 2024 Olympics. Hi, my name is Zia Jael Willett. 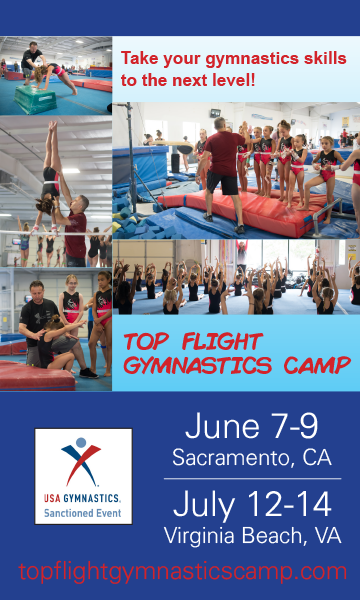 I am a 9 year old level 8 gymnast.I am training for my third developmental camp. My goal is to become an elite gymnast and compete in the 2024 Olympics.